Note: Please use regular EFile software for this purpose. EFile software can generate tax return print as well. If you don't have an EFiler ID, use 'A1234'. Please click this link for details about Form&Access. Note: Please use regular EFile software or the above Forms&Access program. More details from this link. A valid EFiler ID/Password are required. 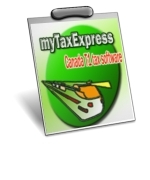 The only unlimited T1013 option now is with myTaxexpress 2018 EFile software. For 3 unlimited installations, the price is $219.64, tax included. It is meant for up to 3 computers. Form&Access doesn't limit by software installation, it uses network saved points to file T1013, and RC59. Note: Multiple Jurisdiction return is needed when tax payer has self-employment business/farm/fish activity outside of the tax province for the tax year. Form T2203 must be entered in tax return to determine multiple provincial tax/credit involved. The first two-return return license costs $6.99 each, tax included. Each additional return license costs $4.99, tax included. You can make a payment using last option on this page. Windows (and for Linux Wine) 17MB taxexp18_special.exe NetFile version, for yourself, family and friends. taxexp18_efile_special.exe EFile version, you have CRA EFiler ID and password. Copyright © 2001-2019 Arcadia Solution Corp. All rights reserved.